I have been blog hopping a lot lately. Trying to read, leave comments and bookmark blogs that are informative and interesting. These blogs give me additional information that might be useful in the future. Anyway, I have just noticed that there are bloggers that regularly post around 3-5 articles in a day while still there are blogs that only have a single post weekly or just around 5 to 10 posts a month. It made me wonder, which is really important when it comes to blogging? 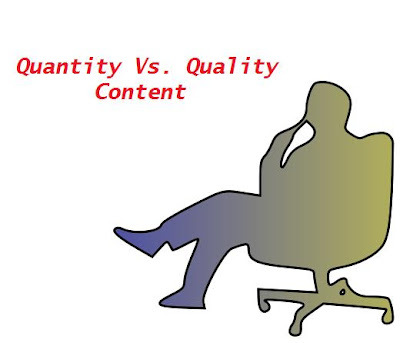 Is it the quality or the quantity of your content? I read several blogs that stated that content is king. Well, it is...but it is also a known fact that with great quantity, the quality would diminish. Correct me if I am wrong but the way I understand how search engines work, they usually grant higher ranking to blog sites with a lot of meat in them. So, which means, the higher rank your blog is, the more you gain visibility and traffic. I observe that most blog sites that got 3 or more contents a day are about current events, movie blogs and personal blogs. Posting a quality content on your blog would take time to research depending on your niche. You also spend time proofreading before you publish your post. It may be a lot of hard work but the result is quite fulfilling. I have noticed several blog sites which have less contents in them but receive several comments and consistent visitors in their sites. Weighing all these things, I can say that quality is much better than quantity since you can get return visits and develop loyal readers who will be looking forward to your interesting posts. However, I cannot discard the fact that quantity is also important in blogging. These two should go hand in hand. Both are necessary for successful blogging. I have seen several blog sites that offer regular post each day without compromising their quality. Their secrets, some have several authors in their blog and some blogs offer guest posting. I can say guest posting will greatly help increase quantity and at the same time maintain the quality of your blog contents. To fellow bloggers and readers, I would like to know your opinion regarding quantity against quality content. You might want to add something important regarding my post. This topic is nothing new and in fact there has been several discussions about this over the years. This entry was posted on Friday, March 16, 2012 at 6:43 AM. You can follow any responses to this entry through the RSS 2.0. You can leave a response. Don't Be Fooled: Buckle Up in the Back!